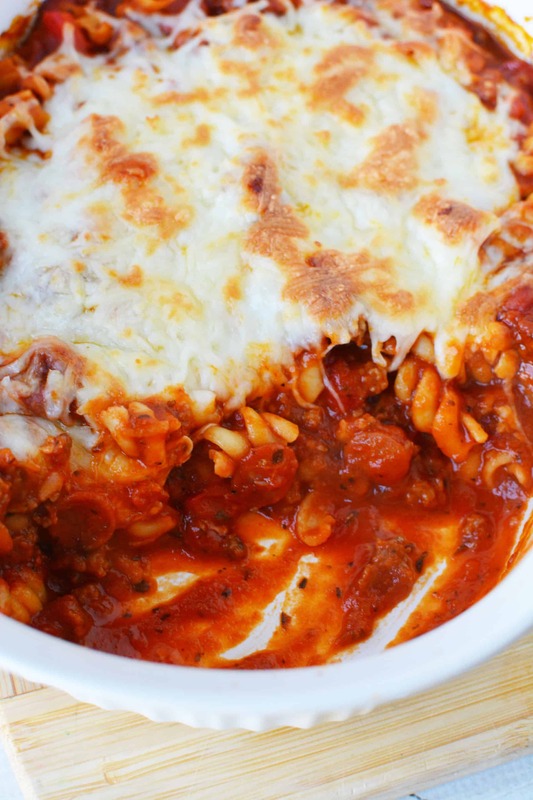 This pizza casserole recipe is a family favorite and extremely easy to make. It’s cheesy and gooey and fills your soul whole. Extreme pizza lovers will approve. This easy pizza casserole recipe has all the taste of a traditional pizza pie minus the crust. 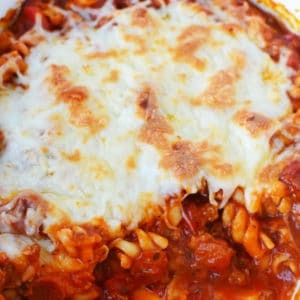 I love to make this dish when my family is craving pasta and when I am in the mood for something hearty and homecooked. The perfect Sunday dinner if you ask me. 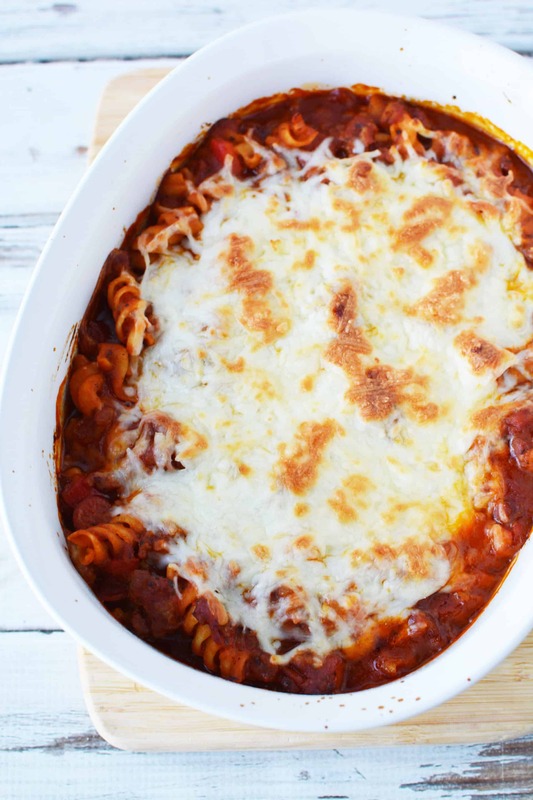 Casserole dishes are my absolute favorite and this pizza pasta dish is super easy to make. It has all the ingredients you hope it does, too – don’t worry! The only thing you should worry about is securing a fresh loaf of Italian bread to serve on the side. Just as an FYI, we included meat in this recipe, but feel free to omit those ingredients if you’d like to make this pizza casserole dish meatless. My daughter doesn’t really like to eat a lot of meat – so we can go both ways with this one. You can also make two small pans – one with meat and one without. That’s what I usually do to appease my crew. And before you get on me, yes, I used jarred sauce. Come at me. I’m a work at home mom with three kids. It’s like that. You can make your own sauce if you’d like, but for quick dinners that I need to put together, I don’t have the 2+ hours it takes to make my gravy. If you really want to see my recipe, it’s from 9 years ago and it’s ugly, but here you go. Preheat oven to 350 and grease a 2-1/2 quart casserole dish with nonstick cooking spray. Set aside. In a large bowl combine pasta, pepperoni, sausage, onion flakes, red pepper, pizza, and pasta sauce and mix well. We are already off to a great start. I’m starving. Pour into prepared pan and then top with cheese. That’s it for prep, my people! Bake for 20-25 minutes or until heated through. If you did end up getting that Italian loaf, you should consider warming it up now. Broil for 2 minutes until cheese is bubbly. Remove from oven and serve. What do you think of this dish? Something you’d like to try out with the family? Are you in a pizza pasta mood right now? I sure do hope so! If you’d like, you could get creative and add any toppings that you would add to your pizza order. What Are Some Toppings I Could Add? Extreme pizza lovers will probably say that they want ALL of these on their pizza pie. LOL! But I’m not so sure how that would taste. 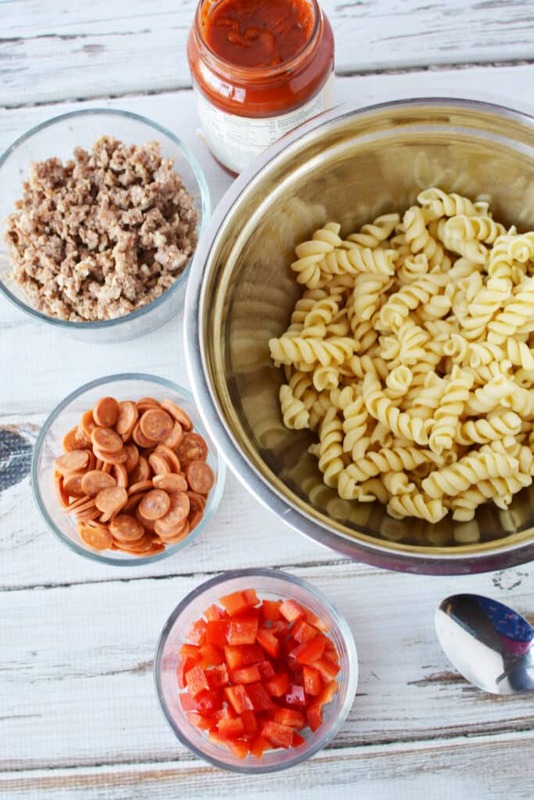 Here are a few examples of what you could add into this pizza pasta dish. What Is The Most Popular Pizza Topping In The Us? Since we are talking about it, I was a little curious and so I just had to look it up. Pepperoni is actually the most popular pizza topping. 36% of people order pepperoni on their pizzas. It’s a good thing that we’ve already included this in our pizza casserole recipe. 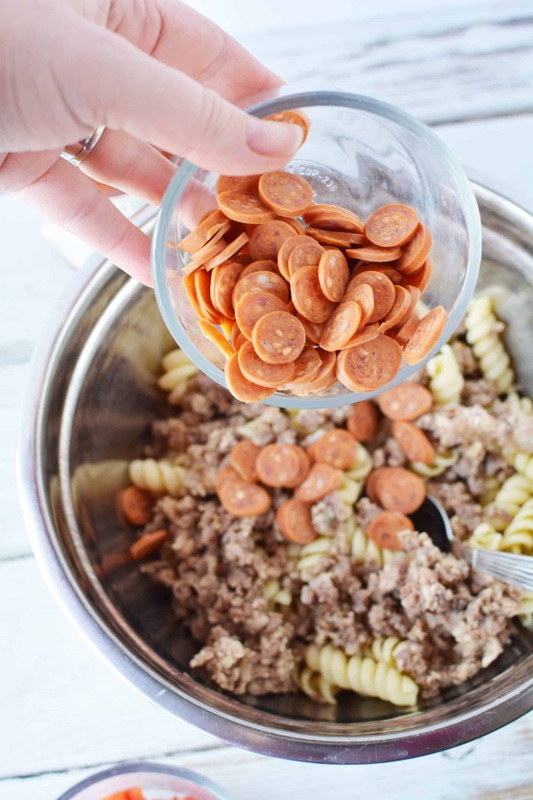 In a large bowl combine pasta, pepperoni, sausage, onion flakes, red pepper, pizza and pasta sauce and mix well. Pour into prepared pan. Top with cheese. Bake for 20-25 minutes our until heated through. Broil for 2 minutes until cheese is bubbly. Easy Overnight French Toast Bake Recipe – But There Is A Secret! 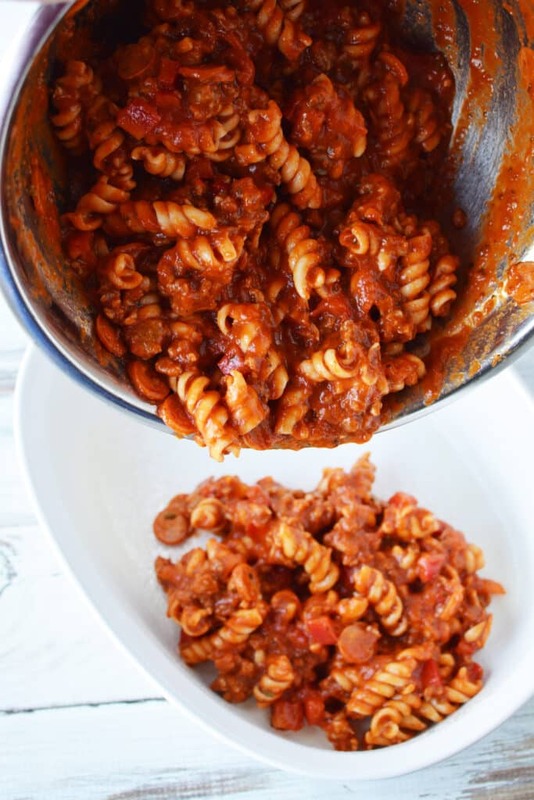 Sounds delish…I love Rao Sauce or Mario’s Marinara but most of all I love a quick sauce that I make with olive oil, garlic, a can of San Marzano tomatoes and a little bit of basil and thyme simmer 20 minutes. Depends on how much time I have to create dinner. Thanks for this recipe Vera!